Further, unlike in more developed nations, where fixed is the predominant form of broadband access in South Africa, mobile broadband is predominant – it is also, unlike in those markets, both cheaper and faster than fixed. However, wireless is inherently less stable than fixed broadband technologies such as XDSL and fibre and the implications of not having ubiquitous, reliable always on high-speed connectivity for the economy and global competitiveness are serious. 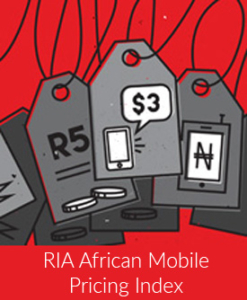 Read Research ICT Africa’s policy brief on broadband pricing in South Africa. For a detailed description about the methodology applied for measuring broadband performance, download the policy paper draft for comments on investigating broadband performance in South Africa 2013. A description of the broadband baskets methodology is available in the policy paper on the future of broadband in Africa.